Hate the dearth of storage space offered by your teeny-tiny bathroom? A small bathroom, especially when it is shared with other family members, can soon start to look and feel cluttered and disorganized. Here are 5 easy life hacks for your tiny bathroom ---- designed to maximize the small space and keep your bathroom free from clutter. Now you can enjoy every square inch for the smallest room in the home with these simple yet genius ideas! Have only one bathroom cabinet? A small space means things inside are cluttered and hard to access, right? Use the back of the cabinet to solve your problem! 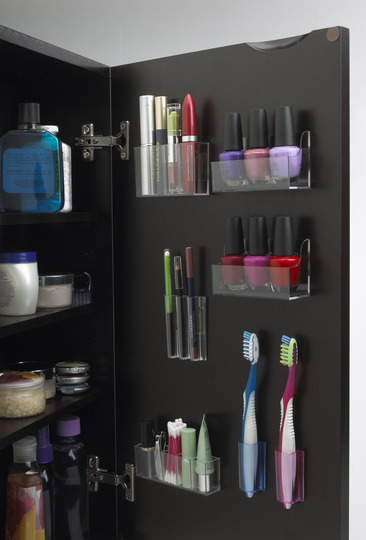 Use small stick-on organizers and hooks to neatly store smaller toiletries, perfumes and knick knacks behind the door, so that the shelves are not cluttered, and you have easy access to everything. Plus the cabinet becomes a lot more organized too! Don’t have space to put up a wall mounted shelf for the shampoo, conditioner, body wash and loofah? 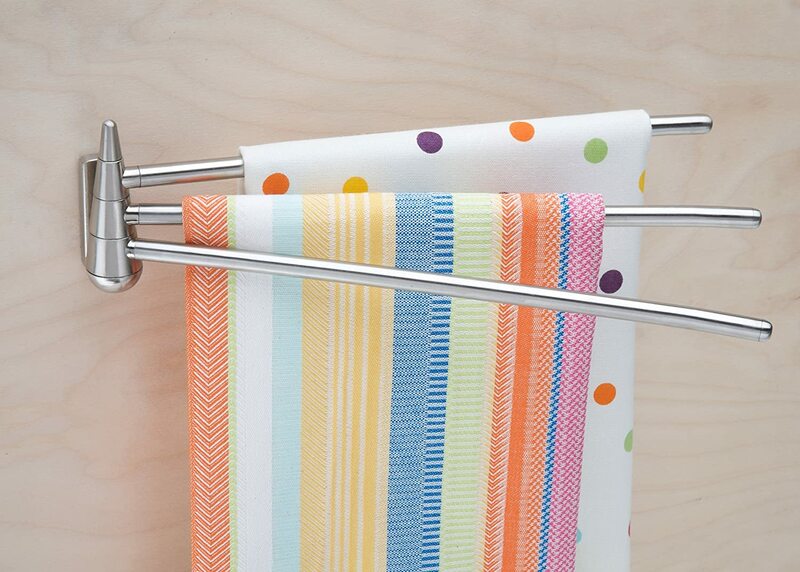 Simple – install a second shower curtain rod on the other side, and use small perforated baskets hung with shower curtain hooks to keep all bath essentials within easy reach! Isn’t that brilliant! Make sure you use baskets with holes, so water can easily drain out. Why just hang one when you can hang more?If you share your bathroom with the family and want to be able to hang 3 to 4 towels at a time, use the back of your door to install towel rods one above the other, and get more hanging space! Not enough space to use a wicker basket on the sink counter to hold hand towels? Don’t worry --- this DIY project solves this problem too! Make a wall mounted towel organizer with old tin cans and some pretty floral printed paper! It’ll also make your bathroom feel more like a spa. Now this idea is ingenious-----put a bookshelf over the bathroom door to create a ledge that lets you store extras! 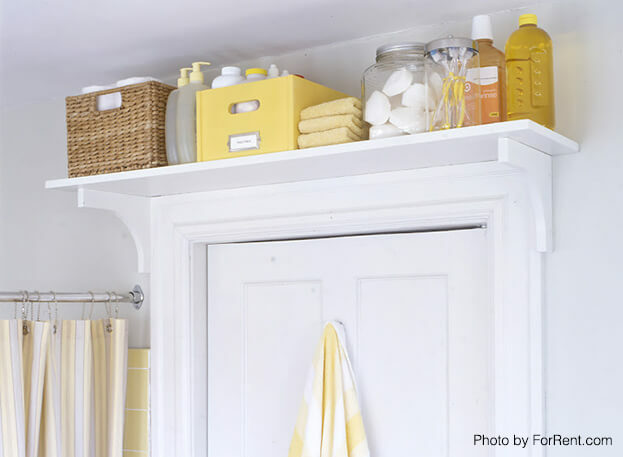 You probably won’t want to store your most-used items up here, but you could put extra towels, cleaning supplies and extra toiletries elegantly tucked into a pretty bin on the ledge. Wondering what to do with all those unused boxes lying around? Here are a few interesting ideas how those boxes can be put to some great use as colourful home accessories. A Moroccan theme can really add elegance to your home decor. Here are some great ideas about what you can use to incorporate this wonderful theme into your home. Are you looking to get on the DIY bandwagon for home decor? Just follow our simple tips on how to go about it and you'll be good to go! Want to know how to change the look of your old bathroom without remodelling? Just follow these tips and you'll be good to go! Choosing an elegant, sophisticated and charming thematic décor is more than just a process. Keep these do's and don'ts in mind when choosing a thematic decor for your home. Here are a few simple, low-cost ways to give your home a vintage touch. Wondering if your home project is a DIY or something that needs a professional? Here's what you need to know to make the right choice. For renters, the chances are that your tiny city apartment also came with the landlord’s list of ‘Don’ts’; that make it impossible for you to drill holes or make any changes to the existing home. Here are a few simple ideas to decorate without any permanent changes. Love the idea of re-using and recycling? If so, you’ll love these 10 DIY ideas to recycle empty bottles! Do you often work from home? Create a space in your home and make this the only place you work in when you are at home. After all, your home is for you to relax and not really work! To know how to turn a part of your home into your very own 'home office' read more! Love wallpaper? It’s that time of the year when most of us are thinking about upgrading our home décor for the upcoming Festive Season. If you decide to work from home, your space management design can be a huge determinant for your productivity. So here are a few tips to help you boost productivity and make the best use of your space. A tiny apartment will test your space management skills. Here's 6 great DIY furniture ideas to make the most of your space. How to Grow Your Own Herb Garden? Regardless of how large or small your balcony is, growing your own herb garden is easier than you imagined. If you're looking for a budget-friendly home décor makeover, look no further. Here are 6 home décor bloggers with their unique DIY ideas to transform your space. Wouldn’t it be wonderful to come home to a place that encourages peace, calm and relaxation? If that’s what you long for, a Feng Shui friendly interior décor could be just what you need! If you love DIY projects that allow you to recycle canning jars and turn them into something pretty, you’ll love these simple ideas on how to turn mason jars into vases! While you could buy readymade home office furniture at most stores today, DIY ideas are a lot more fun! Here are some inspiring DIY chic home office ideas for you to try. Here are some simple things you can do to mundane things found in around your kitchen to liven up the room.